We take pride in announcing that GoodWorkLabs recently partnered with PubNub as an Integration Partner. This partnership will enable GoodWorkLabs to deliver innovative high performing real-time web, mobile, and Internet of Things (IoT) applications. This partnership will further strengthen our expertise in delivering real-time applications that perform reliably & securely on a global scale. The Integration Partner Program by PubNub is a global partner program, which enables system integrators and IT consultants to best leverage the PubNub Platform in products and solutions, and ultimately to help grow their business. In today’s fast-moving digital environment, PubNub DSN delivers real-time messaging APIs for mobile, web, IoT, desktops and servers while enabling bidirectional low latency messaging to anywhere on the globe. 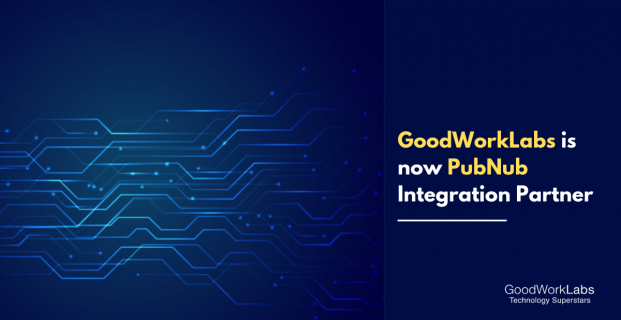 Through PubNub, GoodWorkLabs brings to you the best experience of real-time global messaging, consumer IoT, and live community infrastructure. Please reach out to us for any queries.